In the morning of a wedding it is our job with each one to capture the details of the bride and her party. One of the most important things to photograph is the wedding dress. We will often raise it up into a window or hang it somewhere that shows of the beauty of the gown as well as the feel of the venue. 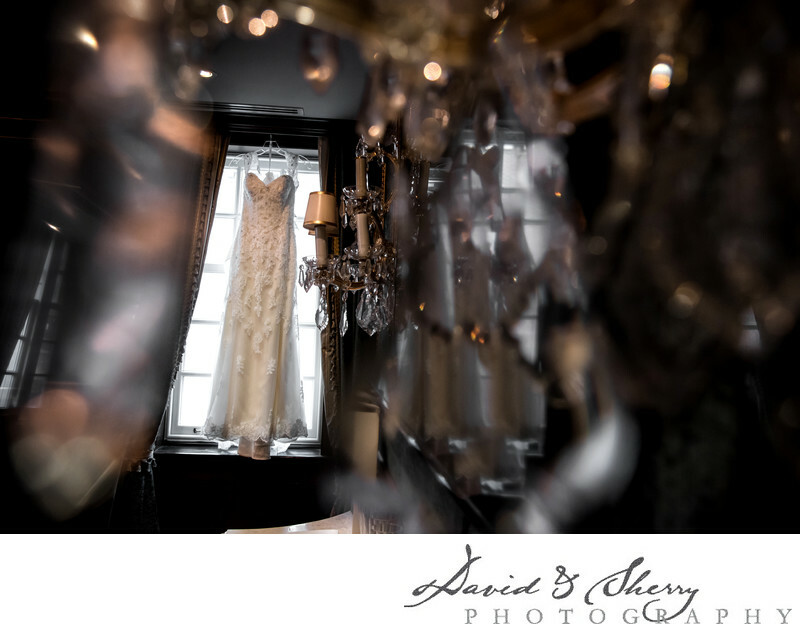 In this instance we were given a room with windows along one wall and some chandeliers along the wall which we were able to use the crystal pendants to distort the light and shoot through them in order to isolate the wedding dress in the window beautifully. This particular sequenced gown with subtle shoulder straps was a perfect fit for the windows that were present in this room. The Drake Hotel is a trendy Toronto hotel that can host up to 200 guests for full service wedding receptions. Kathleen Johansen the weddings and social events manager does a fantastic job catering to each different style of wedding whether it is a modern underground event or a classic outdoor ceremony. We love perusing the grounds of the Drake to capture fantastic, creative, and trendy wedding photos. Location: 1150 Queen St W, Toronto, ON M6J 1J3.